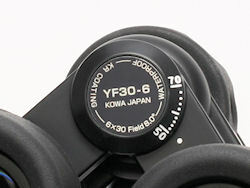 Kowa released their YF binoculars in August of 2011, and there is a story behind these that we really love. These binoculars were originally co-designed by an American and a Japanese engineer, both of whom had 4-year-old children. As such, the YF30 binoculars are somewhat unusual in the optics market because they were designed and optimized just for kids. Children will like the YF binoculars because they are compact and lightweight. They have a large focus knob that turns easily and smoothly, and they were specifically made to fit smaller faces, though they will accommodate most adults as well. Parents will like the YF binoculars because they are very affordable at just $99.00 and for the 6x and 8x models respectively. Let us tell you more about why we really like these. YF binoculars from Kowa are a porro prism design, meaning that they are wider than they are tall. These binoculars stand 4.5 inches tall and measure 6.25 inches across, but fold down to just over 5 inches width. That means they have a very broad interpupillary distance range (think of this as the distance between your eyes) of 50-71 mm. Most roof prism binoculars have only 16-18 mm of interpupillary distance range and they typically have a minimum of 55-58 mm. This means that the YF binoculars fit much more comfortably on a small face, though they will also accommodate most adults. The YF comes in 6x30 and 8x30 models, all in black rubber armoring with red accents. The 6x and 8x refer to the magnification of the binocular, while the 30 is a reference to the diameter of the objective lenses in millimeters which gives a rough estimate of how much light they can admit. Greater width means more light, but at the cost of size and weight. Since the goal was a compact, lightweight binocular for little hands to use, they went with smaller objective lenses. It’s a good choice. The YFs are feather-light, at 17.1 oz. for the 8x model and just 16.8 oz. for the 6x version. The focusing knob is particularly large, and its rubber coating has cut-out ovals that provide additional purchase, making it easier for small fingers to use. The action is very smooth which again makes it easier for a younger user to manipulate it. 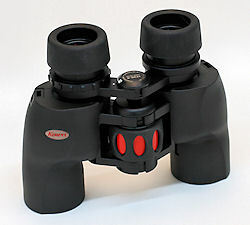 The focus mechanism is pitched quite steeply: these binoculars go from minimum close focus to infinity in about 0.7 turns of the knob. Having less distance to travel to achieve reasonable focus is an advantage in a child’s hands. The published minimum close focus for the YF binoculars is 16.5 feet, but when we tested it, we found they were quite a bit better in practice. We measured both models of Yfs at 13 feet. That distance will vary from user to user, but they are good estimates. And while a minimum close focus of around 10 feet is not particularly close by modern binocular standards, the YFs have excellent depth of field. This means that when they are focused to a particular point, the amount of the world behind and in front of the point that is still in focus is greater on the YFs than on an average binocular, a property that is of great benefit to a child whose precision in focusing may not be as good as an adult’s. Interestingly, the two models have rather different eye relief at 20 mm for the 6x30 and 16 mm for the 8x30. Eye relief in the 16-20 mm range is generally sufficient for all users. We found the Kowa YF binoculars to be surprisingly bright for a 30-mm binocular. The image quality was excellent, very sharp and vibrant. Color fidelity was great with no detectable bias in color; brilliant white objects stayed brilliant white. The YF binoculars also did well in terms of having very little chromatic aberration – that fringe of color that is visible on the edges of very brightly-lit objects, and that was mostly at the outer portion of the visual field. There was almost no “pin-cushioning” – the tendency for straight lines to bow inward at the edge of the visual field. Those observations suggest that the Kowas have really good flat-field performance. Balanced against this, we noted that the edges of the field were a bit “mushy”, focally. This is less important since, of course, you look through the center of the lens and not the edge. One property at which the Kowa FY binoculars excel is the size of the field of view. The 6x30 YF binoculars have a 420-foot field of view at 1000 yards. The 8x30 being higher magnification have a smaller field of view than their cousins, but it’s still a very hefty 393 feet at 1000 yards. This property has important consequences, especially for someone inexperienced with binoculars trying to aim them at something. First, if you can see more of the world around you at a glance, the chances are better that what you were looking for specifically is in view when you lift the binocular. It’s worth noting in this context that lower magnification is also advantageous when little hands may not hold a binocular as steady, since image shake is reduced at lower magnification. The 30-mm barrels are also easier for a child to hold steady. Kowa binoculars are made with high-quality BaK-4 glass prisms and are fully multi-coated for increased light transmission and brighter images. In the key user-adjustable parameters, everything is simple and basic on the YF binoculars. The diopter is adjusted with a twist ring on the right ocular. A raised ridge on the ring lines up with a white dot on the ocular tube to indicate the position for equal eyes, while plus and minus signs to either side indicate the direction of adjustment. The ring stiffly resists movement to help hold its place. The eyecups adjust with a helical twist: counter –clockwise pulls the cup out while clockwise closes it down. There are two completely stable eyecup positions between fully in and fully out, marked by solid detents. There’s nothing fancy here, but it is all functional and utilitarian. Kowa did really well with these properties. Traditionally porro-prism binoculars aren’t sealed, so most are not waterproof, but the Kowa YFs are sealed and waterproof at least initially. We have no data about how long they retain that status with use and wear. It is worth noting in this context that Kowa warrants their product to be free of defects in material and workmanship for the lifetime of the product. The rain guard is the same kind that we’ve seen again and again: a pair of soft rubber cups joined by a flexible bridge region. The strap threads through a complete bracket on the left side and a gapped one on the right, so that it can be readily detached and swung free if the user prefers that. The fit of the rainguard is tight enough that it is not readily dislodged even when inverted and shaken, but it goes on easily. In other words, it’s about perfect. The hard plastic objective lens caps don’t fit as securely. In fact, these will dislodge easily and be lost in the field, so their primary function is to protect the lenses when putting the binocular in its case. Had they been made out of the same rubber used in the rain guard, they might have been a bit more useful, but overall, it’s a very minor point. The strap is the usual inch-wide, padded leather and nylon cord affair. The strap fits into recessed lugs at the corners of the objective tubes where they won’t come into contact with the hands, a nice bit of design. In a binocular this light, the strap has little impact on user comfort, and if it’s an issue, there are plenty of comfortable straps and harnesses available. The rubber armoring is comfortable in the hands, providing a secure grip without adding too much weight, a nice compromise overall. Lastly, the case is a simple padded vinyl affair with enough room to easily house the optic, and a flap with a Velcro closure that adequately covers the binocular. The case has a belt loop on the back, to facilitate carrying it into the field. While it’s clear that the Kowa YF binoculars were made with kids in mind, kids may not be the only users who will like it. Due to the compact, supremely lightweight design, the surprisingly good optical performance and the very low price gives the YFs a broader appeal than they might otherwise have. This is a great first binocular for a beginning birder of any age. By the way, all the features that make them ideal for kids or beginners also make them a great binocular for more elderly users. We wish we’d had starter binoculars this good when we first began looking at birds!